The talented musician Kevin Earnest married the beautiful Katie Oberly at the Dana Powers House and Enchanted Barn in Nipomo, California. Kevin's wedding style was similar to his daily style, which is just effortlessly cool. 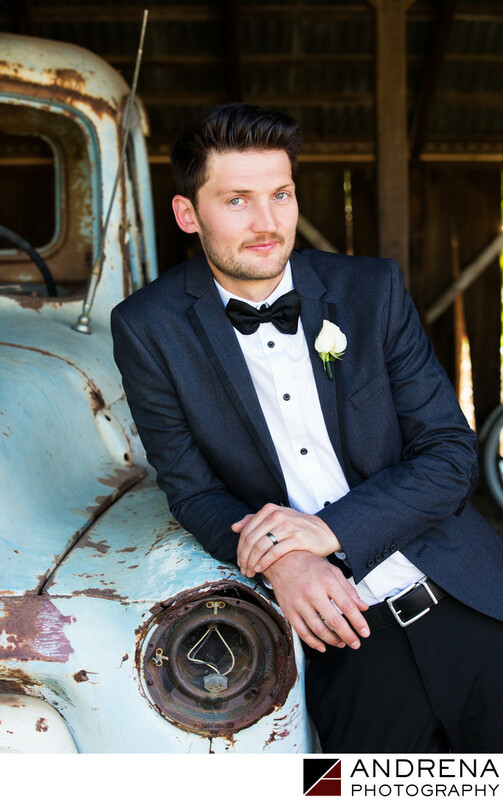 His fitted suit and bow tie looked great at their vintage wedding, which took place next to an orange grove and barn. When I photograph grooms, I often turn their heads slightly away from the camera, then have the look back at me. I usually have them turn left and then turn right, as people often have a better side. To make the portraits come alive, I encourage my grooms to give me a mischievous look. When the eyes come alive, the photograph comes alive, too. This vintage truck was a fabulous place to create groom portraits. The light was perfect and the truck's fender was a great height for leaning. I also loved the blue color of the truck, which looked great with all its rusty patches. Kevin is a truly great guy, and at the end of his reception, he hugged me and said, "You are family for life." Vintage wedding photographed at the Dana Powers House and Enchanted Barn, Nipomo, California.